Open Farm Day is the fourth Sunday in July! Mark your calendar for the 30th Annual Open Farm Day, Sunday, July 28th, 2019 to experience Open Farm Day throughout the State of Maine! Learn more about this annual event! News and updates about Open Farm Day! Open Farm Day is an annual family adventure for the public learn about the business of agriculture. Open Farm Day gives families the chance to visit local farms throughout the state the fourth Sunday in July. Farms around the state participate to commit to ensuring the sustainability of agriculture. Maine’s farming industry gives back to their communities by inviting guests to their farms and businesses. Open Farm Day is a choose your own adventure with education for all ages. Visitors meet the people of Maine agriculture--Maine's farmers and the businesses who support them. 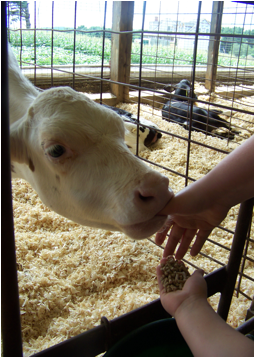 Many farms have demonstrations, displays, farm-raised products for sale and animals and crops to experience. Activities include barn and field tours, milking, hay rides, nature trails, beautiful scenery, and samples for tasting and refreshments. Attend Open Farm day to learn about the value of Maine agriculture and how to support it year-round! The 2019 Open Farm Day Passport will be available this summer. Open Farm Day Visitor Survey - Did you visit a farm? Please, tell us about it! Event Participant Applications - Registration is now open! Farm Safety Check: Agritourism - Planning information and safety check lists. Extension Training for Agritourism Development - Video modules and supplemental planning material. UMaine Cooperative Extension - Variety of agritourism resources for farms. July 28 Open Farm Day! Interested farm participants should contact Anne Trenholm at Anne.Trenholm@maine.gov or 207-287-7620 with questions. Get Open Farm Day & other events news!